I'm not a fan of non-fiction/memoirs/biographies but I was given this book by my boss after he found out I'd read the Millenium Trilogy. I'm glad he shared it with me. Short and touching, it's made me view Larsson and his trilogy in a new light. I had no idea he was such a passioante activist or that his life was endangered by his work. Truly inspiring stuff...except for the fact that it sounds like he worked himself to death. 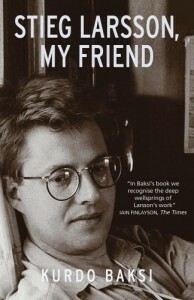 Recommended to fans of Larsson, if you're looking for a brief insight to his life.